The Seawall is the best walk in all of Vancouver, B.C. Siwash Rock is only one of many splendiferous views along the way. In a city known for its international cuisine, including my personal favorites of Japanese izakaya and ramen and Chinese restaurants in nearby Richmond worthy of Hong Kong, I’ve come across really tasty examples of not local (i.e., Northwest) food but grub transplanted from Montreal. 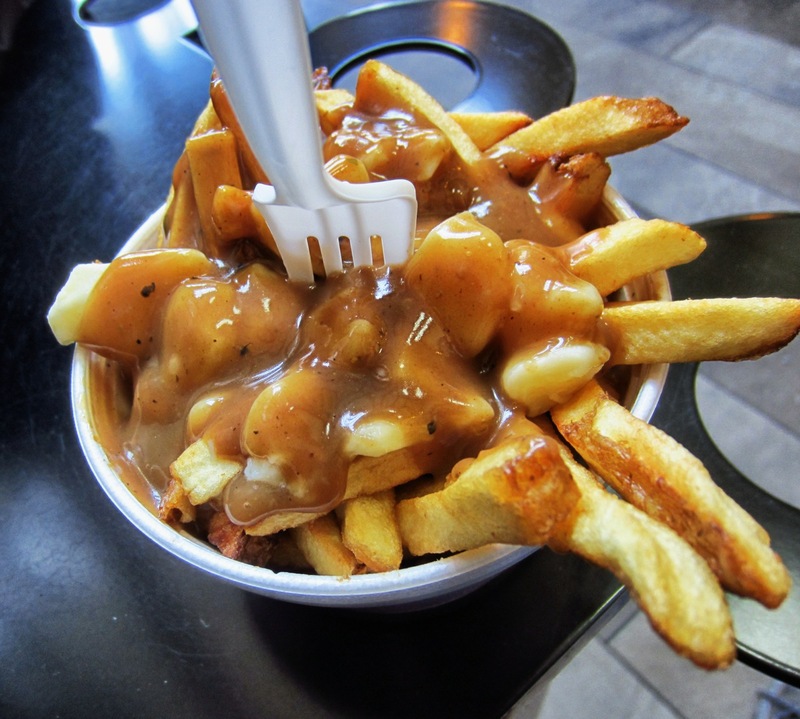 No doubt you’ve heard of poutine, the Québécois fast-food combination of French fries, cheese curds and gravy. At first, the thought of it wasn’t all that appealing to me, but then I realized that Yanks drench their fries in ketchup, chili or even melted cheese, so the concept of smothering fried potatoes with sauce is not just a Canadian thing. 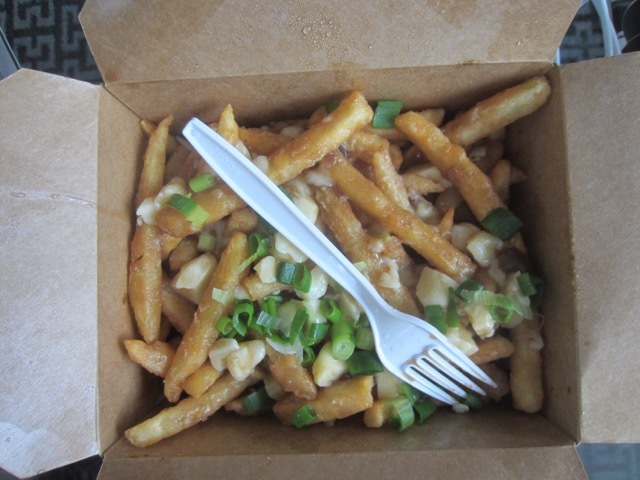 Over a year ago, I had very good poutine at Fritz European Fry House in Vancouver, judged mainly on its gravy, a deeply satisfying, savory bombshell. There were a few hiccups. Starting off very crispy, the fries softened under all that hot gravy and the cheese curds melted and became stringy. While in town again, I was looking at a Vancity internet map last month when I noticed another poutinerie (that also sells hot dogs) only blocks from our hotel. Mean Poutine is only a counter operation on Nelson near Granville. There is nowhere to sit though you can stand and eat at the counter. My wife got a single order for takeaway and brought it back to our room. I didn’t see any visible gravy, though the fries were clearly wet. I thought it odd that it seemed to have disappeared, more like dissolved into the potatoes. The fries were cut thinner than Fritz’s but they were superior, having a double-fried texture and a very thin batter that gave them an appealing crunchiness. The curds also kept their shape. An interesting twist, one which I liked, was the addition of sliced green onions. Many Canadians eat these snacks late at night, which explains why Fritz is open until 2am-4am, depending on day of the week, and Mean Poutine until 4am. This is not a good idea if you’re trying to keep the poundage off. Great bagels on the West Coast are hard to find. The ones here tend to be softer than their East Coast counterparts, verging on being bread-like. I’ve heard East Coasters complain about western bagels. In college in L.A., I had a Jewish buddy from New Jersey who more than once made the same claim. And so did Joel Siegel when he moved from Montreal to Vancouver. He decided to open Siegel’s Bagels in 1990. He incorporated his vast experience that he accumulated while working at a Montreal bagel shop. The bagels would be boiled in a kettle, baked on shivas in a 25-ton wood-burning stone-hearth oven. At the original Kitsilano location and the newer one on Granville Island, you can watch them being made. Siegel’s bagels are seriously good. The bagel can by itself be an object of meditation: what the perfect one should be like. They have the requisite crispy exterior, a chewy inside and modest size that make almost all bagels I’ve had before pale in comparison. Lack of added salt also makes Montreal bagels taste sweet. 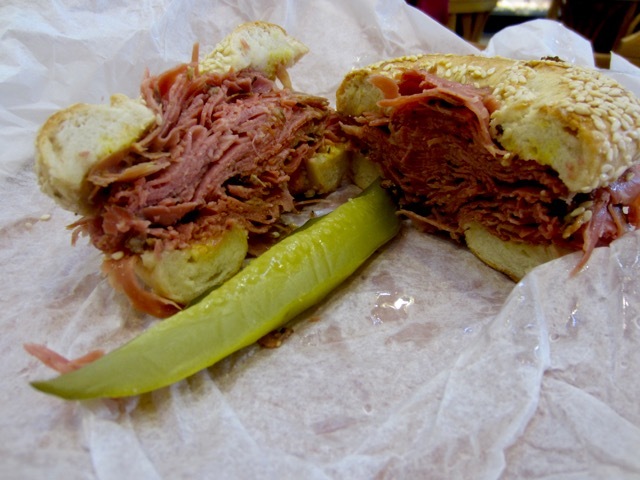 For me, they find their greatest expression in the form of Siegel’s signature Montreal smoked meat sandwich on a sesame bagel. Siegel’s has not only transplanted the quintessential Montreal-style bagel to Vancouver, it also imports (weekly) smoked brisket from Montreal, which is then thinly sliced and heated in-house in portion steamers. All that’s needed is a slathering of plain yellow mustard to complete a whole that is greater than its parts, at once chewy, crispy, nutty, salty, sweet, tart and savory in perfect balance. The whole thing yields to nearly effortless bites, never a jaw-tiring or sandwich-deforming exercise that denser bread would produce. Vancouver is lucky to have a taste of Montreal in its own backyard, and so am I with only a three-hour drive away. Several years ago, we stumbled on a Thai restaurant on our way to another restaurant. The thought of Thai food sounded good right then, so we changed our plans and decided to eat there. We were impressed with the quality of the dishes we ordered, especially their gai hor bay toey (marinated chicken thighs wrapped in pandanus leaves). This time, we returned to Sala Thai (across the street from the Burrard Japadog) as a destination. This is a very fine Thai restaurant. We will order the gai hor bai toey (☆☆☆☆) every time we eat here. The yum nuea (☆☆☆) was also very good, though the beef was somewhat chewy, mingled with a tart lime dressing that had just the right amount of sweetness and burned from a liberal dose of cayenne. A savory addition of shredded pork flakes topped the pineapple fried rice with chicken (☆☆☆), another very good dish. The least successful entree was the stir-fried eggplant with garlic, Thai basil and bell peppers (pad ma-kuer) (☆☆), the flavors not fully developed. For lunch in the Granville Market area, we wanted to eat at Go Fish, but (being Monday) it was closed. A highly regarded Afghan restaurant, just on the outskirts of Granville Island, was also closed. A sushi shop next door was too humid inside, so we went up the street and came across Sawa Tea Lounge, a Japanese restaurant that specializes in tea and donburi. We were meant to find this place. I don’t normally choose donburi at a Japanese restaurant, but today I did. My soboro chicken donburi was absolutely wonderful. The rice, perfectly cooked, was infused with a superb dashi sauce that dribbled down from the minced chicken and egg topping. The scrambled egg was perfectly cooked, not dry but moist and full of flavor. I just sat there and savored every bite. I haven’t had such a donburi in a very long time. My wife had the cold soba noodle special. The noodles were made with green tea and the salad on top was dressed with an excellent ginger vinaigrette. While we still want to have a meal at Go Fish, it would not bother us in the least to come back here. Even before it opens, Stepho’s Souvlaki Greek Taverna has a long line of customers waiting to get in. No reservations are taken, so you never know when you’ll get seated. The reason for the popularity is the Greek food, lots of it for the money. In particular, the roast lamb is what brings many customers back for more. It’s debatable if their other dishes command such praise. If you love lamb, then you can do no better than to have it here. It is fall-off-the-bone tender and flavorful.